Katie recently reminded me of how ridiculous the waiting lists were for new-release books while we were in Minneapolis. Some never became available in our three months there. But today we got our Nashville library cards and then scooped up tons of great stuff. Among our take: TV on the Radio, Black Mountain, bookmaking books, Nicholson Baker's "The Anthologist," non-fiction like "TYPE: The Secret History of Letters," and reference like "Armed and Dangerous, a writer's guide to weapons" and "Modern Guns Identification and Values, fifteenth edition." On DVD we'll be watching, "The Puffy Chair," a road trip comedy; and "Circus Palestina," a strange foreign flick about a runaway circus tiger. But the greatest grab of all was the B-52s "Anthology," which proves how absolutely rocking they were. We love the inter-library loan system. We'll most likely get items from the main downtown branch, which sports amazingly huge and beautiful murals that depict the cityscape over the centuries, then return them at the small branch just 7 blocks from home. So: Share some library thoughts in the comments. Have yet to venture to the Lakeland library, which probably pales in comparison in size and scope of the Nashville library. 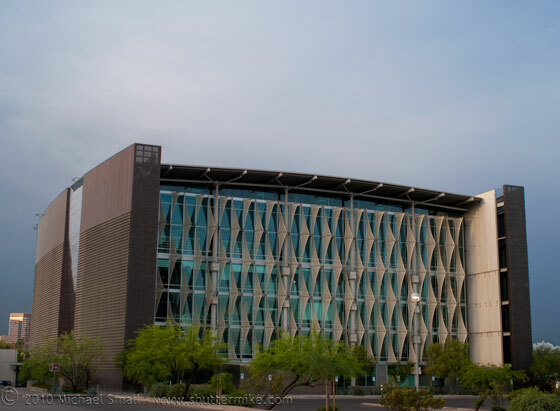 I do remember being excited to check out the libraries in Phoenix, during my internship. One was the expansive, modern and ostentatious Scottsdale branch (where I found some great music and "Angels in America" (the book). Then, I finally had the chance to explore the Burton Barr Central Library in downtown Phoenix. I remember feeling especially excited for this place, which earned a spot in the "Best Bathrooms of the World" list at some point on the Travel Channel. Sadly, the bathrooms didn't wow me ... but the size of the place -- with it's five floors -- was enough to keep me busy for a few hours. The Helen Matthes Library itself is tiny, and I'm almost certain I've checked out every book worth checking out at said library. OK, that's a lie, but I really do look over every shelf in the library once a week and always see the same books. (I did, on a whim, find a book called "
Luckily, the Rolling Prairie Library System rivals MelCat and it doesn't even cover the whole state, just Central Illinois. They have a shocking amount of books (even semi-obscure rock'n'roll books that I never would have expected them to have) and they usually get to me in less than a week — 3 days average. Impressive. But would you expect anything else from a system that boasts as a member the Abraham Lincoln Presidential Library? Didn't think so. Also, the U of Illinois library in Champaign is impressive. It's also underground, which is sweet. Wish I could actually check out books from there. I love that interlibrary name: Rolling Prairie Library System. Pretty cool. Our downtown library is a traditional stone building, but renovated around 2001, so very nice inside and non-musty inside. They have a pretty cool archive/photo area from the now-defunct Nashville Banner newspaper, and other goodies too. CHASE: Why was the bathroom one of the best, allegedly? Since I started grad school for library science, I spend way more time on the Illinois library-share system than is probably healthy (except this week, because it's down for maintenance). I've tried to take advantage, and as a result, have stacks of books piled around my computer, as if I were building some kind of fort of information. As a grad student, I apparently never have to return these books, so i get understandably giddy. The last time I was on campus at UIUC, I went into the undergrad stacks (the same ones Jack can't get into). The undergraduate library at UIUC is underground, solely because it was built next to the school of agriculture/a very historic field of corn, and an above ground building would have killed it. It extends for ten stories underground, and that's not counting the library collections that are housed in the Rare Book Room and at the Oak St. storage facility, or in any of the other libraries on campus. The only people allowed in the UG stacks are faculty, library workers, and graduate students. It's for good reason, I suppose, because the underground stacks are TERRIFYING-- there's no climate control, the lighting is either inconsistent or a fire hazard, the supports are cast iron (which is brittle enough that the building could, haha, collapse, especially in event of a fire), and there's an unsavory student track record at other libraries on campus--apparently, aside from gettin' it on in the stacks, students have been known to throw ragers, as well as food fights. There's also a really good chance of getting lost. I enjoyed my time below ground, but as the cataloguing system for the UIUC library is Dewey and not the (vastly better) LOC, it's a total mess down there. Anyway, I have way more library stories than are appropriate for this venue, but suffice to say: they are boss places. I love what they hold, and everything they stand for. Jack & KR: The main 'brary at UIUC is awesome. Have you been there? The card catalog meanders through rooms and hallways and there are some magnificent murals at the entrance. Also, I really do understand why LOC is preferable, but I can't help myself: LONG LIVE DEWEY! The Tippecanoe County Public Library downtown is less than desireable. The lighting is poor, and it's a relatively new structure but feels at least 30 years old (not a good age for any building). They put all of the specialized genre fiction--gothic romance, sci-fi, mystery, etc.--in with literature. So I'm looking for Anna Karenina and I find Tall, Dark, and Texan sitting next to it. Everytime I go there I want to yell at somebody. They also do not have a copy of Blood Meridian. Fortunately, Purdue has/can get anything we need here in Lafayette. Anyway, it's almost like MELCAT except that Chicagoans must be snobs about their libraries (their books are too good for us Downstate hicks? ), because Chicagoland and Nothern Illinois are not included. But I'm excited for the fact that this new system should give me reciprocity with the UIUC library. Naomi, I really hope you checked out "Tall, Dark and Texan." A few days after moving here, I stopped into the Detroit Public Library main branch to get a library card but haven't returned since. No specific reason other than I hate carrying around change for parking, and my schedule does not line up well with that of the library. I used MeLCat extensively in Hillsdale, so I guess "walk across the quad" is my convenience threshold. DPL's main building is a nice, though - a fine complement to the Detroit Institute of Arts building across the street. Anyway, good news: My new place in Hamtramck is two blocks from the public library.